This lovely wine stopper was one of the guest table favors at my daughters wedding. They are well made and packaged beautifully. They were a hit!! All of our friends at our Valentine party were delighted with their open heart wine stoppers. I tucked it into the napkins which helped decorate the table. The Open Heart Wine Stopper put the party "over the top". It was a great gift for very little money. I would definitely recommend it to my friends. These are great and you cant beat the price. I give them as hostess gifts and my friends loves them. Perfect favor for our bridal shower. Perfect for almost any occasion. Great gift for almost any party. Everybody drinks wine so it's not a favor you're going to put away and never use until one day you throw it out. Adorable party favors. Have given these in all styles many times! My sister and I gave a 60th Anniversary party for our parents and gave a wine bottle stopper to each guest. Everyone really loved them!! This was the perfect addition to a very elegant evening to celebrate the many years of service at a retirement dinner! Thank you so much! Used it for my parent's 25th silver anniversary. It was simple & elegant and tied in perfectly with the theme. Its pretty good quality and looks very nice. I definitely recommend it for large or small events. Great Purchase. High quality for the low price paid. Used as party favours for 50th birthday party. Received many comments. Would recommend this wine stopper for anyone looking for quality at a GREAT price. Gave away as volunteer thank you. We have tight budget but I think they were a very nice give-away without breaking the bank. Gave these as favors at the bride's engagement party. Cute and simple. We love this bottle stop. It's a great value - less expensive than what I've found at other stores & just as nice as anything else that I've seen. I wanted something functional to give away at my reception that people will use and not just throw away. This wine stop hits the mark. The open heart wine stopper was given as a shower favor and everyone loved it! Everything was great about the product. It even came with a little Thank You tag so you don't need to make add'l tags if giving away as party favors. I had many guests ask where I got the wine stopper. They looked much better than I expected. I had to screw on the tops to a few of them, but once I did that, I didn't experience any other problems. I would recommend it for any bachelorette party! I was more than disappointed to see the bottle stoppers only came in a plastic bubble wrapping.. definately no way to hand them out at the shower. I never saw that in the description so it may be my own fault. Secondly, there is only 1 rubber seal around the stopper. As time has gone on since I bought them, I have found much better quality for a cheaper price. Others have several rings that will seal your bottle better. This was a great shower favor, and looks adorable when contracted with the solid heart wine stopper. The only concern was that it looked a little sharp! Guests loved it though! Good job. Great value. Very cute product! The open heart winestoppers were a quality product.I was very pleased with my purchase! My group used these as favors for a Sweetheart Banquet with cellophane-wrapped bottles of wine as the "giveaway" centerpieces. Everyone loved them, and the price was great! I would highly recommend these. They look much more expensive than what they cost. Excellent value. I was looking for a little something to say "thank you" to all those who helped plan an event. The heart wine stopper was perfect! It was from my "heart" and the event had a "wine" raffle. I threw my sister her bachelorette in Southern California's version of Wine Country - Temecula. These made the perfect topper to the gift bags presented to each of the attendees and all of the girls loved them. [...] You just have to tighten the heart onto the stopper and it will stay secure. Good find! I was very pleased to find these bottle stoppers. The Bride was very specific about what she wanted and when I showed her this product, she was very happy. The quality is amazing, each piece is well done and very heavy. I was happy that you made this process very simple. This simple and elegant bottle stopper is a popular party favor for people who love wine. Chrome finish and a hammered metal look give this favor an artsy touch. 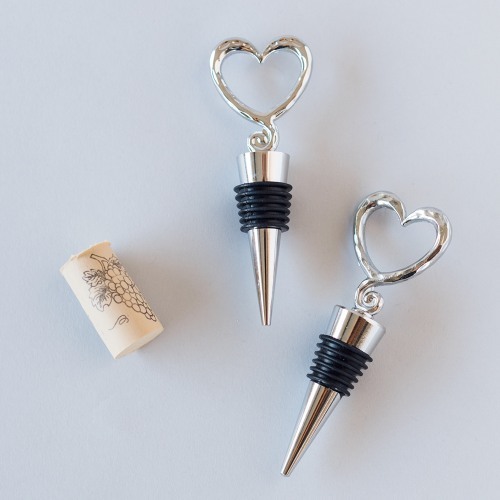 Each open heart wine stopper measures 4.25"L (gold) and 4.5"L (silver). For a more personal touch, present these lovely wine stoppers with personalized satin ribbon.